We reached the end of this little series, which I enjoyed writing a lot as it also helped me to reevaluate and think about my gear. The most interest received the article about the Big 3. I guess looking at big shiny equipment is what the majority likes =) Nevertheless, the clothing and footwear article highlighted that there are also significant possibilities to save weight with the clothes you wear and the shoes on your feet. Yesterday I looked at the kitchen and miscellaneous little items which we always carry with us, and what good lightweight options there are for these. We got the backpack, stuff sacks and a rain cover there, 834 g in total, not bad. There are lighter options for both rain cover and stuff sacks out there, and I guess I'll get some from Mountain Laurel Design which make fantastic UL gear. Sleeping system and the shelter weight 2426 g. My GoLite Ultra 20° will keep me toasty, and the NeoAir is so comfortable that I will not switch to a CCF mat - which means I might not be able to rise at 5 o'clock in the morning to snap photos of the dawn. For the winter I need to look for a new sleeping bag/ quilt which will push that likely a bit up, except I win in the lottery and can afford one of the amazing Nunatak quilts. There are lighter options for tents available, but I love my Scarp 1 thus will happily carry the few hundred gram extra. My kitchen weights a respectable 395 g, I will add a little 100 ml bottle of alcohol to fire up the MYOG top burner for when I'm too tired to look for wood for my BushBuddy Ultra. An Inferno + Ti-Tri stove from Trail Designs will find its way to me soon, so there even are slight possibilities of me decreasing the weight further and remaining a fire devil! My worn clothes weigh 1604 g, there are some possibilities to shave some further grams off there, for example by getting lighter shoes and pants (The Shelby Koruoma pant is a project I will be working on during the winter). The clothes in my backpack are light at 1211 g, and will protect me from rain and cold efficiently. I forgot to add my Trekmates Amphibian GoreTex socks, which weigh 73 g and also should keep my feet dry as a desert. 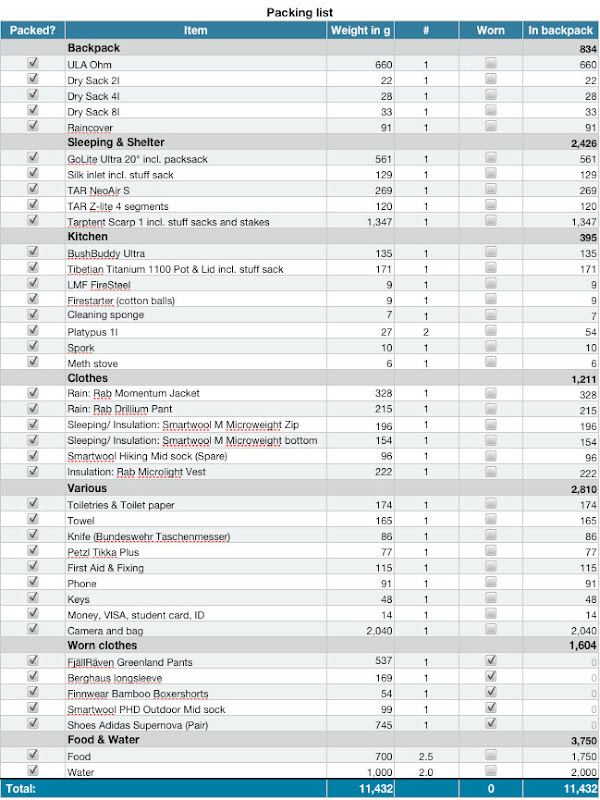 Those various items are the heaviest piece on the list, with 2810 g - but that's due to the EOS 50D and the LowePro Toploader I carry. Dave, The Armchair Adventurer, made himself a very nice camera bag, which I might try to reproduce. That should make it slightly lighter, but having witnessed the difference between point and click and the power of a DSLR my decision was made easy: the DSLR comes along! The towel can be replaced by a small & light UL version, probably saving some 100 g.
Food and water, well, 700 g per day might be a bit much, but its important to have sufficient energy on the trail for me. If I would switch from Ramen and Pasta to Real Turmat I could save some weight per day, and it should definitely taste better. So, for a weekend out, from Friday afternoon till Sunday early evening I would start with a pack weight of 11505 g. Ideally that will mean I come home with a backpack which weights 7755 g as I eat and drink away my consumables. I like it. Going light means I can walk more kilometers, take extras like the DSLR which I wouldn't carry if I go "normal" and climb higher. Its natural. I thank you for reading and inspiring me, I had interesting conversations with some readers in the comments - join us if you like! Going light was a very good experience for me, and hopefully this little series has shown that it is not difficult to lose some weight and still be safe and comfortable on the trail!